Would you like to know more about what we are trying to achieve throughout our District 91 UK South – Toastmasters International this year? how many clubs we have and where they are? who’s on the leadership team? What happening a the next district conference? What’s up for discussion at the next district council meeting? These and other questions are answered via the dropdown menu. 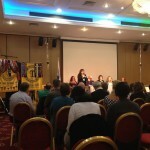 Are there other questions on District 91 UK South – Toastmasters International you’d like answered? This section is here to give you more of an insight into Toastmasters in UK South. You’ll find lots of information elsewhere on the website. If there are further questions you’d like answered please please fill out this survey to let us know.